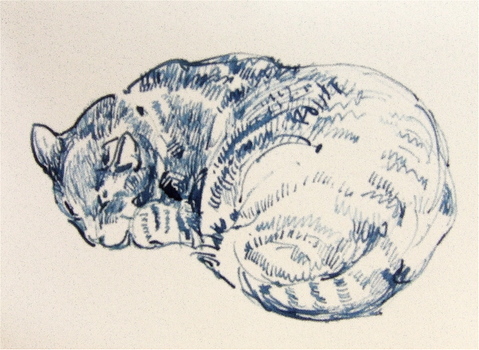 It's really only one cat, my kitty Pearl, drawn with a bamboo pen and Higgins indigo ink and Higgins brown ink on Stonehenge paper. Operating on the theory that smaller equals quicker (I still have barely begun my Christmas shopping) I used small paper, 5" x 7". With such small paper, your marks are smaller and less muscular and perhaps more precise. Compare these marks to those used in the drawing of Abby below. I like the loose approach better with this type of pen, but these drawings showed me how versatile bamboo and reed pens can be. That's worth knowing. My friend Katherine Tyrrell of Making a Mark, has asked me to spread the word about a very interesting competition she has going, for the best blogged paintings and drawings of 2007. Please go read about it and nominate your favorite in each medium by midnight tomorrow!! You will then be able to vote among those works nominated and the results will be published on the last day of the year---what fun! I haven't yet participated but I WILL by the deadline tomorrow, Katherine, I promise! And now, off to do that shopping. Amazing control, Laura for a bamboo pen. Like Katherine, I'd love to see photos of your pens. It goes without saying, your cats are wonderful - perhaps you could hand them out for Christmas, cut out the whole shopping process, and I'm sure everyone will be extremely happy. I still haven't finished - well hardly started actually - and I don't even have sketching as an excuse. Oh, such neat cats!! Merry Christmas Laura to you and all your loved ones. Now go get that shopping finished! Thanks Laura. There are quite a few nominations already but more are very welcome indeed. I'm also very much enjoying seeing some on blogs that I'd not come across during the course of the year - see if there are any you don't know. 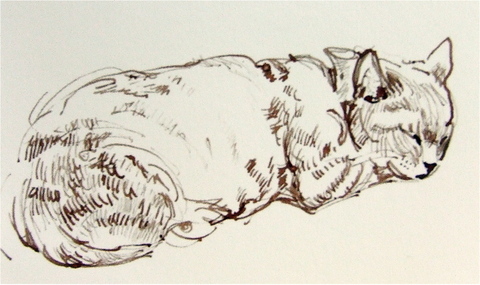 I love the drawings which you're doing with these reed pens and brown ink. I think it supports your style of drawing very well indeed. I'd love to see the reed pen in question. I've got one - but since I cut it myself I'm eager to see what a well cut one looks like!